I didn't realise how unusual the rims were on those fatbikes. Not interesting so much as odd, but a double-boinger branded... Vauxhall. Raleigh 1980s road frame with Suntour teleforks and North Road style bars. A Moulton New Series Speed, complete with Rohloff, belt drive, carbon cranks & seatpost, left unlocked against a tree outside our local pub. The saddle was an interesting contrast to the rest of the bike. A brief "how much?" discussion decided on about £15k, though a post-return google leads me to suspect this may be an overestimate (the double pylon separable is the expensive one). Anyway, more than John's Blackbird. 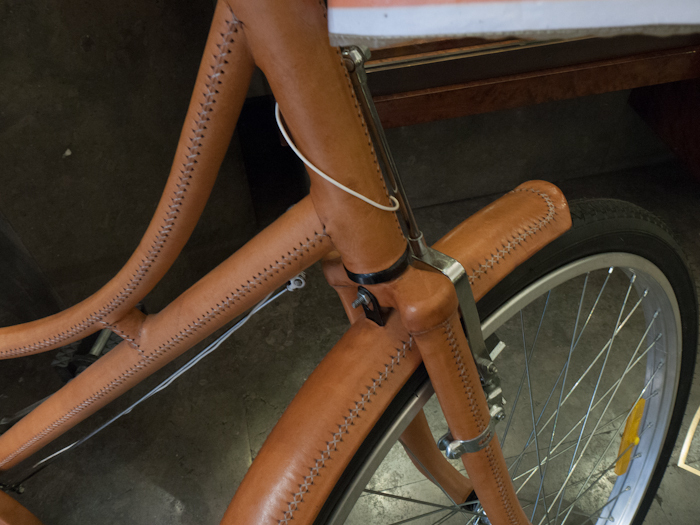 Yes, you have seen correctly, that is a stitched leather covered frame, mudguards and chain case. Yesterday, we were on a ride with a chap who was riding a Dahon Mu with a Sachs Automatix hub. There was a coaster brake, so no cables to the back half of the bike. It was very light. At that price, it's likely to have all sorts of GPS trackers built in. 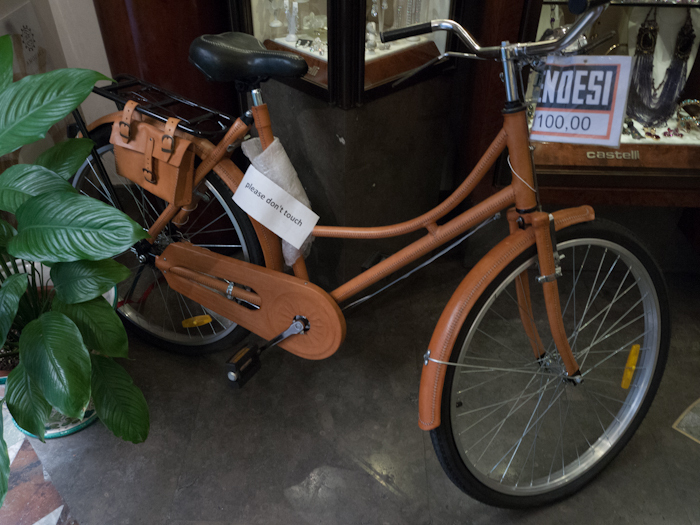 A particularly elaborate "Sting" bike? It sounds like the Moulton a friend owns. Not a sting, more an ongoing project. It started with a Strida belt grafted on but the latest incarnation is much better. 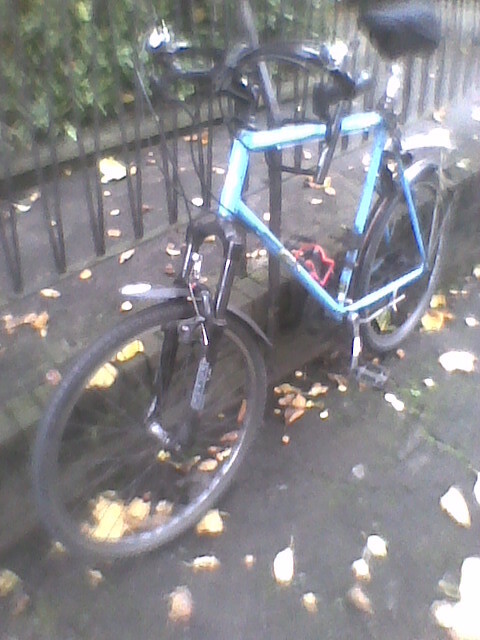 This morning, for the second in a row, I saw a singlespeeded Claud Butler Majestic. 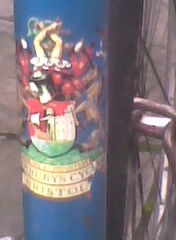 And this morning on CS7, there was a burgundy spaceframe Moulton with wooden mudguards. 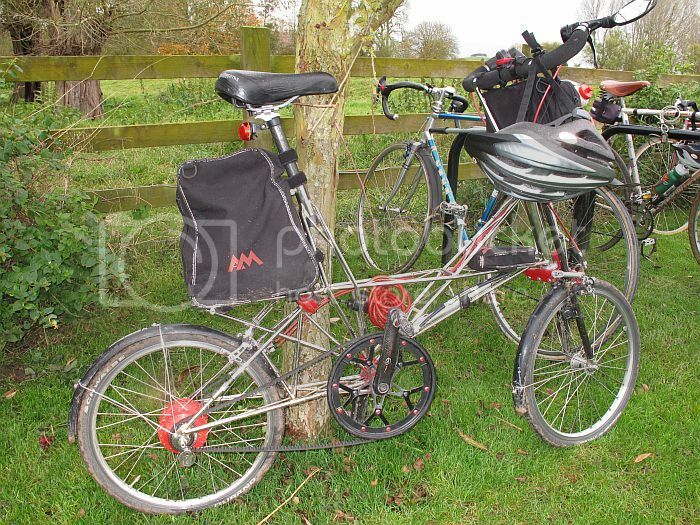 Oh - that reminds me - Butterfly and I have seen a fast (and a bit pushy) rider on a Mk3 Moulton F-frame. In Streatham, I think. 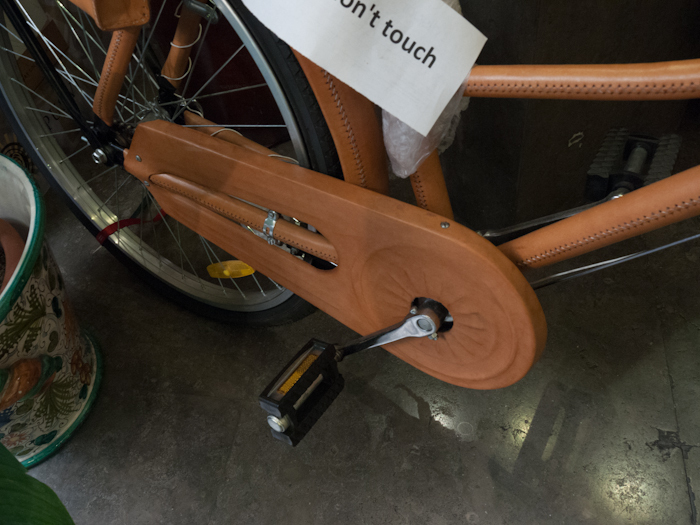 It's a Kickbike. At the TdF Depart in London, they had a Kickbike demonstration race. A Finn did PBP03 on one of those. Would that be the guy with one massively muscular leg? He would do 2 or 3 pushes with one leg, then do a very neat little shuffle and then the same on the other side. His shoes were looking very second-hand by the finish. It seemed like every time I went to get on my bike to leave a checkpoint, the kickbike was parked next to it. It felt like most of a day before I got away from Alpo for good. He was bloody fast downhill. I was just faster downhill than him, but there was very little in it. Crouching below the handlebars really cut down his frontal area. There is someone who regularly rides through Streatham on a variation on that theme. I've never actually seen one in the wild, only read about them a few years ago in a magazine article. In that case it was about someone who'd had to give up normal cycling due to a back injury. Is it worrying that the first thought into my head after that involved fiddler crab style asymmetric development owing to execute ll excessive self love? It seemed like every time I went to get on my bike to leave a checkpoint, the kickbike was parked next to it. It seemed like most of a day before I got away from Alpo for good. He was bloody fast downhill. I was just faster downhill than him, but there was very little in it. Crouching below the handlebars really cut down his frontal area. I caught him on Roc Trevezel, but he was arriving at St Quentin just before me. Didn't he get into the kickbike as summer training for speed-skating? Search for Alpo Kuusisto or whatever his proper spelling is. I understood he raced sled dogs at the top level and was a decent marathon runner. Being a Finn, speed skating and/or cross-country skiing seem probable.